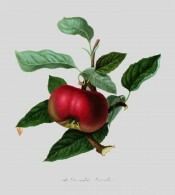 ‘A much esteemed Devonshire apple; of medium size; skin of a uniform deep rich crimson, with numerous green dots intermixed; flesh of a brisk, pleasant, and peculiar flavour. 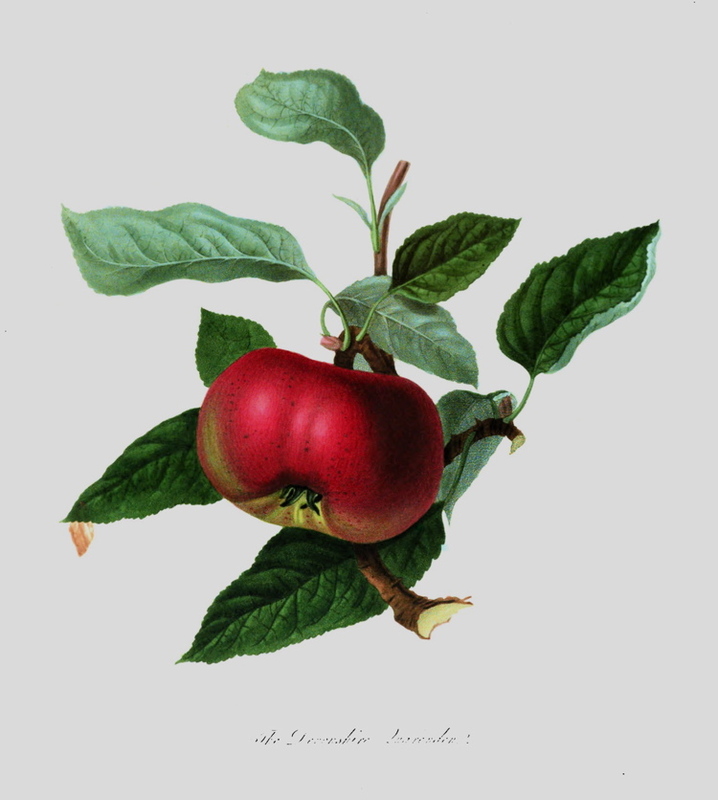 A very desirable dessert apple: from August to November; tree very productive.’ [FCM p.40/1845]. ‘This apple is well known in the nurseries about London, though little of its fruit is brought to market. It is generally supposed to be a native of Devonshire; in which county it is cultivated rather extensively, under the appellation of Quarenden, or Quarener. […] This Apple may be recommended as one of the best varieties of its season; its beautiful appearance and excellent flavour being such as to entitle it to a place in the dessert. It is not, however, calculated for culinary purposes. It is an abundant bearer, and, on espaliers particularly, is highly ornamental.’ [PL p.96, pl.13/1818]. ‘Supposed to be an old variety but there is no record of it prior to 1693, when it is mentioned by Ray.’ Fruit; below medium size, oblate, sometimes angular in outline. Skin; smooth and shining, deep purplish red, except where shaded, then pale green. Flesh; white tinged with green, crisp, brisk, and very juicy, rich vinous and refreshing flavour. ‘A very valuable and first rate dessert apple. It ripens on the tree in the first week of August and lasts until the end of September.’ A large tree and prolific bearer. ‘Throughout Herefordshire the Devonshire Quarrenden is the pride of many a cottage garden, and the richly coloured fruit which loads its boughs is a source of considerable profit to the good housewife.’ [HP pl.III/1878]. ‘Red Quarenden: A bright red apple, good flavour, and a prolific bearer.’ [David Crichton. NHM vol.1 p60/1864]. Listed in the 1845, 1850 and 1857 catalogues [Apple no.30/1845]. There are two references to the quality of fruit in William Macarthur’s records. Red Quarrendon. January to February. Good. Excellent for kitchen. Apt to fall when nearly ripe. Not equal to its English reputation. [Notebook no.9, MP A2948]. Red Quarrendon. January-February. Very showy apple excellent for kitchen and liked by many persons as a dessert fruit, apt to fall when becoming ripe. [Diary B, 1862, MP A2951].